You're in charge of your American life. Big Government has no rightful claim on your dreams, and your ability to provide for your family. Here in Mesa County, Senate District 7 which I represent, we are hard working, independent people who value our family, our land and our jobs. My very first political campaign was for House District 54 in the Colorado General Assembly in 2010. That was a hard season for everyone in Mesa County. I stood up for our way of life then and I will continue to be the strong voice for our working families. My job has been and will always be to protect your liberties and your equal opportunity so you can live your American Dream. I ask for your continued support as your Colorado State Senator for District 7. Join our campaign efforts and get updates from Senator Scott. 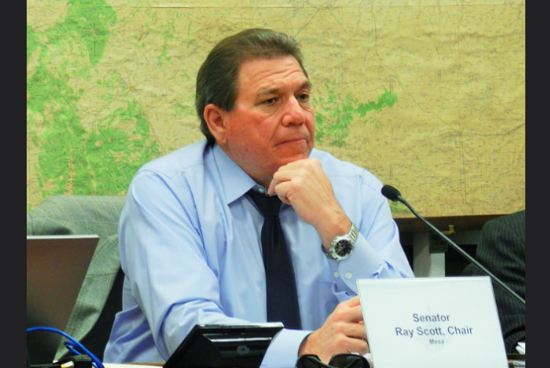 Senator Ray Scott represents Colorado Senate District 7 in Mesa County. Senator Scott was born in Ohio and grew up in Rifle, Colorado a small town where principles and values were instilled. Working on farms and ranches with his family were key to understanding just how important individual freedom and hard work can mold a desire to serve others. Senator Scott began his work career with Conoco as a terminal manager and later with Williams Energy in Colorado and New Mexico. Senator Scott always had a desire to own his own business. With an entrepreneur's drive and velocity, he founded several businesses in the energy sector, land development, logistics, sports, software, and home construction. He built and sold companies that had extreme success on the one hand and great learning opportunities on the other. These experiences helped develop a wide variety of knowledge of how government can interfere and in some cases destroy the American dream. At the State Capitol, Senator Scott works to reduce job-killing regulations that stifle growth, oppose new taxes on Colorado’s middle-class families, and fights to prioritize funding for safer roads and bridges in our state. He is a fierce supporter of fossil fuel development as these industries are the backbone of Mesa County and thousands of good paying jobs all over Western Colorado. Senator Scott has been a fail-safe defender for the people of Colorado against the far left progressive policy that hurts the very people government is supposed to protect. When not at the Capitol or working with his business ventures, Senator Scott enjoys hunting, fly-fishing and spending time with his family and friends. How important is having a strong job market? How important is it that we have a thriving energy sector in Colorado? How important is it to have our elected Colorado State Legislators protect your persons, and private property? How important is funding that follows the child in education? How important is it that parents be in charge of their students education? Do you believe that Colorado State Government has limited the growth of our economy with over burdensome rules and regulations in Mesa County? Do you think that Occupational License (excluding public health) have prevented Mesa County Residents from economic mobility and achieving their American Dream?